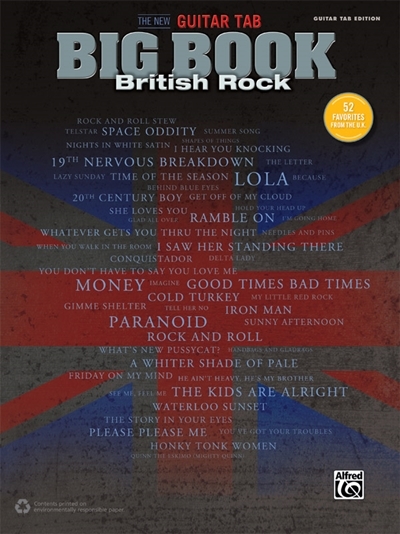 The New Guitar TAB Big Book: British Rock contains 52 smash songs from the U.K., from such bands as The Beatles, The Rolling Stones, Led Zeppelin, T. Rex, Black Sabbath, The Kinks, and more. Each book comes with lyrics and guitar TAB transcriptions for every song, so music makers can recall and create a lifetime of memories. Titles: 19th Nervous Breakdown (The Rolling Stones) * 20th Century Boy (T. Rex) * Because (The Dave Clark Five) * Behind Blue Eyes (The Who) * Cold Turkey (John Lennon) * Conquistador (Procol Harum) * Delta Lady (Joe Cocker) * Friday on My Mind (The Easybeats) * Get Off of My Cloud (The Rolling Stones) * Gimme Shelter (The Rolling Stones) * Glad All Over (The Dave Clark Five) * Good Times Bad Times (Led Zeppelin) * Handbags and Gladrags (Rod Stewart) * He Ain't Heavy, He's My Brother (The Hollies) * Hold Your Head Up (Argent) * Honky Tonk Women (The Rolling Stones) * I Hear You Knocking (Dave Edmunds) * I Saw Her Standing There (The Beatles) * I'm Going Home (Ten Years After) * Imagine (John Lennon) * Iron Man (Black Sabbath) * The Kids Are Alright (The Who) * Lazy Sunday (Small Faces) * The Letter (Joe Cocker) * Lola (The Kinks) * Money (Pink Floyd) * My Little Red Book (Manfred Mann) * Needles and Pins (The Searchers) * Nights in White Satin (The Moody Blues) * Paranoid (Black Sabbath) * Please Please Me (The Beatles) * Quinn the Eskimo (Mighty Quinn) (Manfred Mann) * Ramble On (Led Zeppelin) * Rock and Roll (Led Zeppelin) * Rock and Roll Stew (Traffic) * See Me, Feel Me (The Who) * Shapes of Things (The Yardbirds) * She Loves You (The Beatles) * Space Oddity (David Bowie) * The Story in Your Eyes (The Moody Blues) * Summer Song (Chad and Jeremy) * Sunny Afternoon (The Kinks) * Tell Her No (The Zombies) * Telstar (The Tornados) * Time of the Season (The Zombies) * Waterloo Sunset (The Kinks) * Whatever Gets You Thru the Night (John Lennon) * What's New Pussycat? (Tom Jones) * When You Walk in the Room (The Searchers) * A Whiter Shade of Pale (Procol Harum) * You Don't Have to Say You Love Me (Dusty Springfield) * You've Got Your Troubles (The Fortunes).